free printable dated 2019 calendar — Powell & Co.
simple life. creative life. beautiful life. Happy 2019, friends! Whether you’re a resolutions gal or not, a new year is pretty exciting. This is my 28th new year and I can’t help but chuckle a little when I compare this new years eve with ones past. I didn’t drink a single drop of alcohol, was fast asleep by 1 am, and woke up today on a mission to get organized. WHO AM I ?? I’m not sure, but I am really liking this new gal so far. I am a huge fan of calendars for organizing, but it is so dang hard to find a dated printable calendar. So, I decided to make my own and wanted to share it with you all. 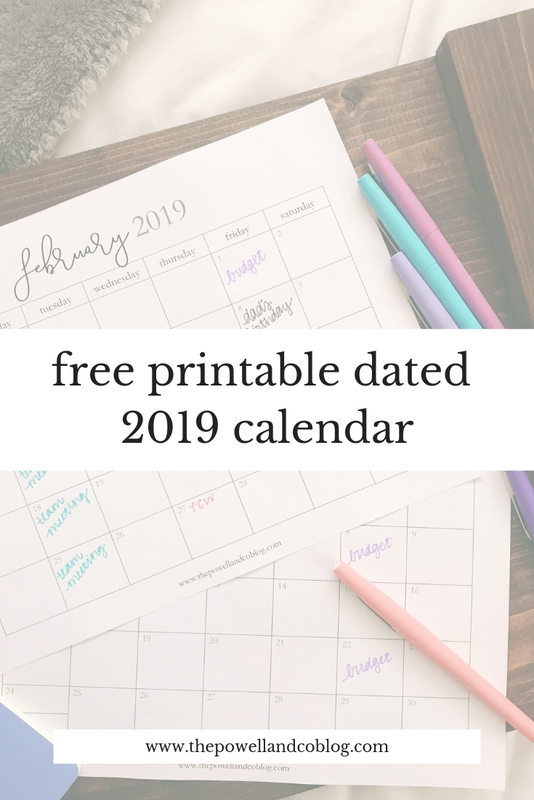 Click here for your free printable dated 2019 calendar! Looking for other ways to live your best life in 2019? Check out these posts! you'll probably like these, too! a georgia gal trying to navigate my late twenties with creativity and grace. figuring out how to simplify my life and sharing what I learn along the way. Sign up with your email address to receive monthly freebies! We respect your privacy and promise not to share your information with anyone!